Why are sharks suddenly turning vicious? So why have so many shark attacks, so close together, occurred off Florida and the East Coast this summer? How great is the risk and is it any greater than in the past? What kinds of sharks attack people? What should I do if someone nearby is attacked? Summer is regarded by many observers of the Human Condition as the "silly season" - a time when youth and free time collide with ignorance and carelessness. It is a formula ideal for turning accidents waiting to happen into media sensationalism. With the attack on two Russian nationals off North Carolina during the Labor Day week-end, media attention on sharks and shark attacks rose to an all-time high. I am a shark biologist. My work is a lot less glamorous than it may sound, consisting mostly of collecting and analyzing data as well as keeping current on what other researchers are doing via reading and correspondence. (Okay, I'll admit it: the time I get to spend in the water with sharks is very cool, but I don't get to do so nearly as often as I'd like.) Much of my research is strictly scholarly and of little interest to anyone except a few colleagues. I would like to state for the record that I do NOT study shark attacks per se — although much my research focuses on shark behavioral ecology, which occasionally touches on some of the same questions. For most of my current understanding of shark attacks, I am deeply indebted to the work of specialists in this field, most notably H. David Baldridge, whose masterful 1974 analysis of the International Shark Attack Files is a model of clear, no-nonsense thinking. Most of the time, I work in splendid isolation. I bother no one and no one bothers me. But over the past two weeks, my usually quiescent phone has been ringing off the hook and my already burgeoning E-mail in-box has been crammed with requests for information about the recent spate of shark attacks and what it all 'means'. Most of the question-askers have been either professional journalists or regular workaday people concerned about their own or their children's safety in the ocean. As someone who likes to think of himself as a "nice guy", I always try to help anyone who asks me - no matter how busy I am at the time. But after answering essentially the same questions over and over about shark attacks, I think it time I prepared a brief statement addressing those questions that pop up repeatedly - a sort of Shark Attack FAQ - to which I could refer interested media people and ocean recreationists. I hope the following answers most of your questions. If it doesn't, I can always be reached at r.aidan.martin@reefquest.com. They aren't. Sharks are not 'vicious', which may be defined as evil, malicious, or prone to violence. Sharks lack a moral code, which is a necessary prerequisite for choosing to behave in a manner that could be called 'evil'. Sharks simply do what they do without ill will or premeditation and thus cannot be labeled 'malicious'. And sharks are not unduly forceful or even particularly aggressive (that is, self-assertive). In fact, sharks are a lot less violent or aggressive than many other animals - including humans. All this defining is not mere semantics. It is not arcane nit-picking. I am trying to make a very important point: to understand the true nature of shark attacks, it is necessary to use words with care and precision. It's an illusion that there are more attacks than usual, closer together than usual. I'm not suggesting that the attacks themselves are not real, but that their apparently unusual pattern isn't. It all comes down to the statistics that describe interval patterns of rare events. 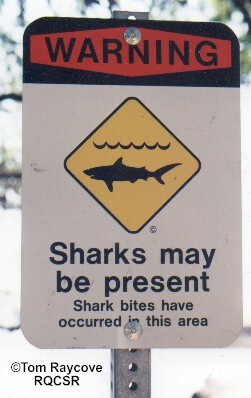 Statistically speaking, shark attacks fall under a class of entities termed "random, independent events". In this respect, shark attacks are homologous to a series of heads-or-tails coin tosses using a fair (as opposed to weighted) coin. Think of it this way: the odds of tossing a "heads", for example, on any given coin toss is the same as the odds of tossing a "tails" - 50%. Therefore, in a series of coin tosses, you would expect about half to end up "heads" and half "tails". However, because each coin toss is independent of previous tosses, it is certainly possible to have a whole series of "heads" in a row without a single "tail" (This sort of clustering of random, independent events is so common, there's even a name for it: a "Poisson burst" - after the French mathematician who first described it.) It might seem weird. It might seem that the next toss must be a "tails". But the odds on getting either a "heads" or a "tails" are exactly the same as for the very first and every subsequent coin toss: 50-50. It's the very same with shark attacks. They can seem to occur in clusters - as they did during the summer of 2001, often termed the "Summer of the Shark". But the likelihood of any one individual being attacked by a shark at a given time and place and the average interval between any two attacks remains constant. Minimal and that's the way it's always been. World-wide, as of 4 September 2001, there have been 51 shark attacks. Forty (78%) of those have occurred in the United States, of which 28 (55%) occurred in Florida. So far this year, there have been three shark attack fatalities (2 in Florida, 1 in Brazil). But what do these numbers really tell us? Each year, world-wide, between 50 and 100 shark attacks are reported. So 51 attacks in nine months is not at all unusual. In fact, there have been fewer attacks this year than there were last year up to the same time. World-wide, over the past decade, there have been an average of 8 shark attack fatalities per year. So the number of shark-caused fatalities this year is actually low compared with previous years. The high percentage of attacks from U.S. waters probably reflects two factors: 1) reportage of such newsworthy stories as shark attacks is more likely in America than in, say, Bora Bora or Kiribati, and 2) journalists' instinct for keeping eyes open for similar stories once an attack has occurred. The high percentage of victims from Florida waters reflects the enormous number of people entering the sea - as waders, swimmers, surfers, skin and scuba divers - in that state. Accurate numbers are difficult to obtain, but it seems likely that the number of people entering the ocean (for any reason) off Florida each year would be on the order of tens of millions. The risk posed by shark attack has been compared to all sorts of (mostly irrelevant) things, including death due to lightning, bee stings, injuries caused by domestic dogs, and - my personal favorite - farm-yard pigs. Risk of death or injury due to shark attack is far less than any of these. But one cannot compare terrestrial and marine injury statistics in a mathematically rigorous way. A far more realistic comparison is afforded by comparing rate of deaths by drowning or injuries to surfers by their own boards. According to a study by the Centers for Disease Control, 4,406 people drowned in America during 1998. That's about 550 times as many deaths as caused by sharks in an average year. According to a Florida Health Department report, 343 drownings occurred in State waters during 1997. That's more than 12.5 times as many as were injured by sharks this year and 172 times as many as were killed by sharks in Florida waters this year. According to a survey conducted by the Harvard Medical School, between May and December 1998, 451 surfers from 24 countries reported a total of 636 surfing-related injuries, of which 426 (66%) were lacerations caused by collision with the sharp nose or skegs of their boards. This means that about eight times as many surfers were injured by their own boards than were attacked by sharks this year. Thus, of all the perils that humans face in the sea, shark attack is among the least likely of them. Traditionally, it was thought that sharks attack people in order to eat them. But that's just not consistent with the available data. According to the most comprehensive world-wide study of shark attacks published to date, 96% of shark attacks consist of a single strike. Wounds are typically open-mouthed slashes or simple nip-and-release interactions resulting in little or no removal of flesh. Although a few very large shark species - such as the Tiger Shark (Galeocerdo cuvier) and White Shark (Carcharodon carcharias), respectively - include sea turtles or marine mammals in their diet, most species capable of inflicting serious wounds on humans feed on relatively small schooling fishes and/or squids. It therefore seems likely that the vast majority of shark attacks have little to do with feeding and must therefore be motivated by something else. "Mistaken Identity" has often been touted as a possible cause of shark attacks - especially those perpetrated by White Sharks - but this 'explanation' does not fit well the available data. Examination of the White Shark retina and behavioral evidence strongly suggest that this species is highly visual and possesses a high order of visual acuity. It is therefore unlikely that a White Shark would mistake the gangly, clumsy, split-legged silhouette of a human for the massive, agile solidity of a seal or sea lion (collectively termed "pinnipeds"). The majority of White Shark attacks on humans are astonishingly tentative, almost 'gentle' affairs. This is very different from the massively debilitating initial strike that characterizes White Shark attacks on pinnipeds, the prey type with which humans are supposed to be confused. If these attacks were truly 'mistaken identity', would not White Sharks' initial strike be much more forceful - more like their attacks on pinnipeds? My suspicion is that the vast majority of so-called "shark attacks" are motivated by either 1) investigation or 2) self-defence. In attacks involving the White Shark, I believe most cases are investigatory or exploratory in nature. White Sharks are highly curious but, without benefit of hands, must rely on their sensitive mouths to manipulate novel objects in their environment. Each tooth has its own nerve supply and can flex forward and back through about 15 degrees. As the jaws gape, the tooth bed is pulled taut and the teeth splay outward. This action, combined with the ability to protrude the jaws with astonishing dexterity, provides the White Shark with an extraordinarily rich source of tactile information. It's not the shark's fault we have such thin skins and so many large blood vessels close to the surface! But most, if not all, of the recent spate of shark attacks along the U.S. East Coast are almost certainly not due to White Sharks. It has been suggested that these attacks may be due to "Mistaken Identity" in that sharks mistake the pale palms and soles of swimmers for the whitish bellies of normal prey fish. I doubt this is the case. My suspicion is that most of these attacks were self-defensive in nature. Humans are not very elegant swimmers and, with our gangly arms and legs, we typically tread water while employing a more-or-less circular scissors kick unlike the swimming stroke of any marine creature. When swimming, we also tend to pay little attention to what's going on in the marine environment around us. Imagine a shark swimming along the bottom, minding its own business, chasing a school of small baitfishes. Suddenly, a careless arm or - more likely - foot lashes out toward the shark's head. The shark gives a rapid defensive snap and makes good its escape. Viola! A shark attack. To my mind, this is a more parsimonious scenario than any involving suppositions and guesswork about how sharks interpret this-or-that portion of human anatomy. Therefore, I would suggest that most shark 'attacks' are provoked in some way, either by the human providing an unfamiliar, curiosity-evoking shape or by inadvertently or carelessly threatening a shark. Scaled by likelihood of inflicting seriousness injury per attack, this ranking may be more-or-less correct. However, on a world-wide basis, I suspect that the Bull Shark - by virtue of its shallow coastal and tropical river habitat - may come in contact with people more often than any other large, saw-toothed shark and may thus statistically be the most dangerous species. Around tropical oceanic islands, the White Shark is quite rare, but the Tiger Shark may be fairly abundant and thus be far more dangerous. In the tropical open ocean, the Oceanic Whitetip is the predominant species and may be the most dangerous shark. But in cool temperate coastal areas - especially off California, South Australia, and South Africa - the Great White is clearly by far the most dangerous shark. It is difficult to know what kind - or kinds - of shark were responsible for most of the attacks off the eastern United States during the summer of 2001. Jesse Arbogast (the boy who had his arm bitten off, then surgically re-attached) was attacked by a smallish Bull Shark off Pensacola, Florida, in July. Sergi Zaloukaev and Natalia Slobonskaya were probably attacked by a medium-sized Tiger Shark off the Outer Banks of North Carolina in early September. I don't know what kind of shark killed David Peltier off Virginia Beach, Virginia, 124 miles (200 kilometres) south the day before the two Russians were attacked. Maybe it was a Bull Shark. As for those seven Florida swimmers and surfers who received minor nips and punctures over that active week-end just before Peltier was attacked, we may never know the attacking species. I suspect they might have mostly been due to Blacktip Sharks (Carcharhinus limbatus), which typically migrate along the Florida coast chasing schools of baitfish during summer months. In practise, it is probably safest to regard any shark longer than about 5 feet (1.5 metres) as potentially dangerous. If such a shark is sighted, prudence dictates that you leave the water. Don't swim, surf, or dive alone. The mere presence of your companion may deter a potentially dangerous shark and - should anything happen - at least help is close at hand. Avoid entering the ocean at between dusk and dawn. This is when sharks feed most actively and you cannot see well to defend yourself in the event of an attack. Avoid areas where there has recently been an attack or where large shark (longer than 5 feet or 1.5 metres) has recently been seen. Avoid entering the ocean near river mouths, especially after a rainstorm. Rain can wash organic molecules into the sea that might attract sharks. Wear swim goggles or a face mask and take the time to look beneath the surface regularly. Such will greatly increase your chances of spotting an approaching shark and, if necessary, defend yourself. Pay attention to what's going on in the marine environment around you. If fishes and other marine life suddenly disappear or begin to swim erratically, leave the water while looking around very carefully - a shark is probably hunting in the immediate area. Keep a first aid kit with you at all times and maintain current status in first aid training from a recognized agency (Red Cross, St. John Ambulance, etc.). Having the appropriate tools and training may help save a life. Don't panic. That may seem a tall order under the circumstances, but most shark attacks result in injuries that are readily survivable and clear thinking is your most powerful asset in an emergency. Do nothing to unnecessarily incite a retaliatory strike on the part of a shark. It may be frowned upon in orthodox ethological circles to anthropomorphize animals, but - based on my experience - I have no doubt it is possible to piss off a shark. Trust me: you don't want to do that. If attack is imminent, defend yourself with whatever weapons you can. Avoid using your hands or feet if you can avoid it; if not, concentrate your blows against the shark's delicate eyes or gills. Get out of the water as quickly and efficiently as you can. If the attacking shark remains in the vicinity, keep the animal in sight as you exit, to guard against the unlikely possibility of a subsequent attack. Make every effort to control bleeding, even before you get out of the water. Apply direct pressure to any open wound to staunch the flow of blood. Avoid using a tourniquet unless rate of blood loss is life-threatening. Seek medical attention. Since sharks' mouths often swarm with a nasty community of infectious microbes, treatment by a physician is always indicated even if the wounds seem relatively minor. Don't panic. That may seem a tall order under the circumstances, but rescuers are almost never attacked and clear thinking is your most powerful asset in an emergency. Get the victim out of the water as quickly and efficiently as you can. If the attacking shark remains in the vicinity, keep the animal in sight as you exit, to guard against the unlikely possibility of a subsequent attack. Although extremely rare, there have been cases in which an attacking shark squirmed between rescuers' legs and bodies to bite the victim a second or third time. Make every effort to control the victim's bleeding, even before you get out of the water. Apply direct pressure to any open wound to staunch the flow of blood. Avoid using a tourniquet unless rate of blood loss is life-threatening. Once on the beach, keep the victim still, warm and hydrated. This three-point strategy will reduce the severity of shock, which can greatly complicate medical treatment. No NOT give the victim alcoholic or caffeinated beverages, which can likewise complicate treatment. Continually re-assure the victim that everything is going to be fine and that help is on the way. If you must leave the victim, assure him or her that you will be right back, then make sure you do so. As promptly as possible, dial 911 for emergency medical attention. Since sharks' mouths often swarm with a nasty community of infectious microbes, treatment by a physician is always indicated even if the wounds seem relatively minor. On the phone, describe the observed facts of the victim's condition in detail, but avoid speculating on things you did not or cannot observe directly. Wait with the victim until help arrives. Accept sharks as a normal part of the marine environment. They were there hundreds of millions of years before our species existed. It is their home and we are the invaders. Despite the apparent flurry of shark attacks in the news of late, shark attack remains an extremely rare phenomenon. The ocean itself is far more dangerous than any shark. Know your limitations and swim, surf, or dive within them. The mere presence of a shark in your vicinity by no means guarantees that an attack is imminent. But - just as importantly - you must not count on the shark to not attack you. When we enter the sea, each of us does so at his or her own risk. The onus is on each of us to assume responsibility for our own safety. Important New Book on Shark Attacks! 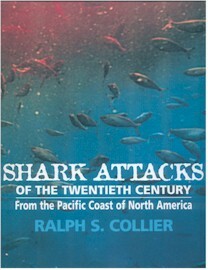 The culmination of four decades' of research by my friend and colleague Ralph Collier, President of the Shark Research Committee, this book is the first scientific study of every verified shark attack that occurred along the Pacific Coast of North America during the 20th Century. Vivid accounts of attacks by survivors, rescuers, and witnesses are punctuated with chilling, never-before published photos. Patterns in shark attacks are identified, possible motivations for attacks are discussed, and activity-specific safety guidelines for swimmers, divers, surfers, and sea kayakers are offered. The individual case histories are fascinating; the general conclusions and safety guidelines are applicable word-wide. If you are interested in Great Whites or shark attacks, this is a Must Have book.